Thomas Laqueur’s book, The Work of the Dead, has several chapters on the rise of the garden cemetery in the 19th century. This is the kind of cemetery most of us seniors are quite familiar with. 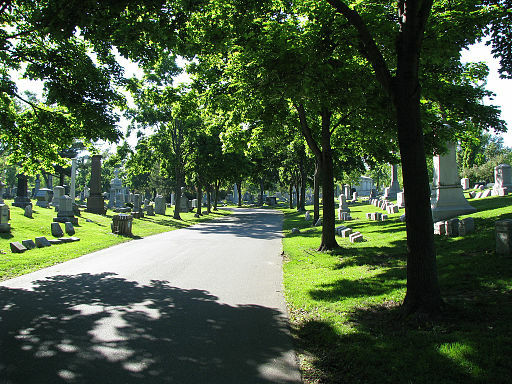 Our parents or grandparents may well be in such a place — a beautiful place for the dead, with many of the comforts or home — privacy, peace and quiet, and a comfortable spot for resting. Garden cemeteries have been tremendously popular in the United States, although I sense they are going out of fashion. My father’s family came here from the English Midlands as poor millworkers, but early on purchased a plot by a pond down a lane in a Massachusetts garden cemetery. We have our family name there, engraved on a granite stone bought by my grandmother. But my father’s remains, and my mother’s, lie in a columbarium in a church in Florida. That brings us to the subject of Laqueur’s final chapters: cremation. The cremation movement arose in the 1870s. Making use of furnaces derived from the steel industry, cremation was seen by its advocates as modern, sanitary, and efficient — doing in minutes what the grave might take years to accomplish. They tried to take away the magic of the body, or disenchant it, as Laqueur would say, by treating it as a waste product. In that, they failed. It seems like most of the folks I know are planning on cremation, but with plenty of enchantment. They may want their ashes distributed among their favorite places in the world — some in that park overlooking Florence, perhaps, some in their own flower garden, and some at their favorite lake or beach. No one I know is planning to have their ashes blasted into space, but it’s possible. In fact, portability has turned out be be one of the main attractions of cremation. Others I know are leaning toward my parents’ choice — placement of their ashes in a columbarium, with their name inscribed on the door to their little niche. Many are thinking of a columbarium in a church, highlighting another attractive feature of cremation. It makes burial in a church, or often just outside a church, possible again. Sally, down in Florida, lies in a church garden near her husband. Both their names are inscribed on a plaque on the church wall. They found comfort in knowing their ashes would be there. Despite Diogenes, disenchantment of the body has never caught on. Even when bodies disappear in a war, or because of a natural or man-made disaster, we remember their former owners by inscribing their names on a memorial. Visitors to the Vietnam War Memorial in Washington often leave messages, toys, or even cans of beer for the dead. The inscribed names have acquired the power of actual bodies to enchant. I imagine that my remains will end up going with the general flow, probably cremated or placed in a green cemetery, rather than being left outside for the local crows and coyotes. Thanks to Thomas Laqueur for making me realize that on balance, it’s probably for the best. This entry was posted in Books, Grave Matters on February 10, 2016 by Ray Copson.